County Wicklow is renowned as the ‘Garden of Ireland’ due to the diversity and quality of its landscape. 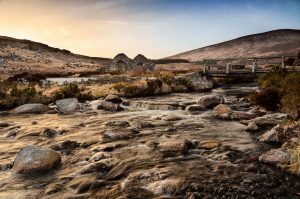 Rolling mountains, glaciated valleys, woodlands and deep lakes along with many rural towns and villages characterise the Wicklow uplands landscape. This spectacular landscape is a living landscape with every aspect having the imprint of human activity. It has been shaped by the activities of those who live and work in the area along with those who visit and use it for recreational purposes. Our connection with the landscape is an important part of our cultural heritage and an integral part in the fabric of our lives. The aim of this photographic competition is to acknowledge and celebrate the rich and diverse cultural heritage of County Wicklow and the contribution that this provides to our daily lives and our sense of place. The competition is being organised in celebration of the European Year of Cultural Heritage (EYCH) which encourages us to ‘Make a Connection’ and to deepen the connection between people and heritage. Cultural Heritage refers to the interactions of people and communities with their landscape from generation to generation and their ways of living. It can be distinguished in the rural landscape, townscapes, buildings, archaeological sites & monuments, agricultural heritage and heritage objects. Cultural Heritage may also be expressed in intangible forms and may include customs & traditional skills, clothing, oral history and folklore. Wicklow Uplands Council invites you to send us photos which depict aspects of Wicklow’s diverse Cultural Heritage. It might be of the stunning landscape, a town or village scene, people at work or play in the landscape, a building, an archaeological site or monument, an activity associated with Wicklow etc., Essentially your ‘connection’ with Co Wicklow. Entrants are encouraged to provide a short caption (60 words max) which provides insight into the story behind the image. Entries to the competition will be selected to form an exhibition on the Cultural Heritage Theme ‘Wicklow Connections’ which will be launched at The Brockagh Resource Centre for National Heritage Week 2018 (www.heritageweek.ie). The theme of the competition is ‘Wicklow Connections’ in conjunction with the European Year of Cultural Heritage (EYCH) and its aim to ‘Make a Connection’. Photographs may be taken in any location in County Wicklow or the Dublin Uplands. Towns & Villages: Co Wicklow is scattered with many rural towns and villages each with their own unique and distinctive character. These towns and villages play a very important role in our cultural heritage as the centres of civic and commercial life while reflecting social, political and economic trends. We would love to see images of from Wicklow’s towns and villages including; townscapes, buildings, old shop fronts, architectural features, market squares, monuments etc. Activities: The Wicklow and Dublin uplands are a living landscape where people live, work, and recreate. We all enjoy the landscape and we would like to see photos which demonstrate people at work or play in the uplands. This includes activities in an upland town or village setting. Include a photo caption (up to 60 words max) which provides some insight into the connection with the photo e.g. What is your ‘Connection’ with the image; what is the story associated with the subject of the image; is there an upland connection? Etc. This is an amateur photographic competition which is open to all ages. The closing date for entries is the evening of Tuesday 7th August 2018. Entries will feature in a photographic exhibition at The Brockagh Centre Laragh during National Heritage Week. Please see www.heritageweek.ie for details on local and national events. A gallery of the images entered will be published on www.wicklowuplands.ie.and may also feature on social media and other online channels. **Please note that photographs submitted as entries may be selected by Wicklow Uplands Council for use in publications and other promotional material. There is a total of €500 in prizes with further prizes to soon be announced. The submissions of photographs will be considered a full acceptance of the guidelines and terms and conditions relating to this competition as outlined on this page. Your personal details will only be used to contact you in relation to your entry and any subsequent exhibitions related to this competition. All entries may be published to a gallery on the Wicklow Uplands Council website, social media and other online channels and your full name may also be published alongside it. The age of any minors may also feature.